Nationwide classroom testing shows WestEd’s Reading Apprenticeship Framework promotes literacy and content knowledge, as well as motivation and positive academic identity — leading to better student outcomes that stretch beyond the classroom walls. 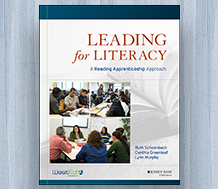 Leading for Literacy: A Reading Apprenticeship Approach* guides teacher leaders, coaches, and administrators through the nuts and bolts of implementing the Reading Apprenticeship Framework. Authors Ruth Schoenbach, Cynthia Greenleaf, and Lynn Murphy of WestEd’s Strategic Literacy Initiative provide concrete tools and examples for improving student reading across secondary schools and colleges. This new guide is a perfect companion to the landmark publication, Reading for Understanding: How Reading Apprenticeship Improves Disciplinary Learning in Secondary and College Classrooms, 2nd Edition. Visit the Leading for Literacy: A Reading Apprenticeship Approach resource page to learn more. *Available for ordering in December 2016.